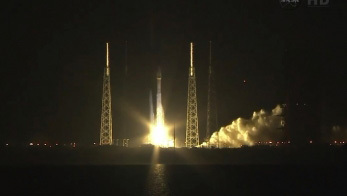 With a rush of sky-lighting flame, a United Launch Alliance Atlas 5 rocket blasted off from Cape Canaveral Thursday evening and boosted a NASA Tracking and Data Relay Satellite into space, the second in a $715 million upgrade of the agency's globe-spanning communications network. The rocket's Russian-designed RD-180 first stage engine ignited with a flash at 9:33 p.m. EST, throttled up to full power and majestically boosted the 192-foot-tall Atlas 5 away from launch complex 41 at the Cape Canaveral Air Force Station. Liftoff came 28 minutes late because of data dropouts in telemetry from the satellite that troubleshooters blamed on unexpected interference in the launch communications network. Engineers implemented a work-around and mission managers decided to proceed with the launching. Climbing through a clear, cold sky, the rocket smoothly accelerated as it consumed its load of liquid oxygen and RP-1 rocket fuel, generating 860,000 pounds of thrust as it arced away on an easterly trajectory over the Atlantic Ocean. About four minutes later, the RD-180 shut down, the first stage fell away and the rocket's hydrogen-fueled Centaur second stage engine ignited to continue the push to orbit. Two firings of the RL10A Centaur engine were needed, the first to reach a preliminary "parking" orbit and the second, an hour and 22 minutes later, to complete the climb into an elliptical "geotransfer" orbit with an expected low point of about 3,000 miles and a high point around 22,240 miles. Both burns went off without a hitch and NASA's 12th Tracking and Data Relay Satellite -- TDRS-L -- was released from the Centaur stage at 11:19 p.m. to complete the initial launch phase of the mission. "We're all thrilled," said Tim Dunn, NASA's launch manager. "A successful spacecraft separation and most importantly, a successful spacecraft acquisition by our ground telemetry. So we've confirmed we've got a healthy spacecraft." If all goes well, on-board thrusters will fire five times over the next 10 days to put the spacecraft into a circular 22,300-mile-high orbit. At that altitude, flying above the equator, satellites take 24 hours to complete one orbit and thus appear to hang stationary in the sky. The TDRS-L satellite joins a constellation of eight other relay stations, including an orbital spare, stationed over the Atlantic, Indian and Pacific oceans. The spacecraft relay voice, video and data to and from the International Space Station and support a wide variety of science satellites in Earth orbit, including the Hubble Space Telescope and NASA's fleet of Earth-observation satellites. Built by Boeing Space Systems, TDRS-L and TDRS-K, launched in January 2013, feature phased array S-band antennas that can pull in signals from five spacecraft at once or transmit to one satellite at a time. In addition, two 15-foot-wide steerable antennas can handle high-speed Ku-band communications, along with S-band and Ka-band traffic. Using upgraded equipment at ground stations in White Sands, N.M., and Guam, the TDRS system provides near continuous communications coverage for the International Space Station and other high-priority government spacecraft in lower orbits. The newest TDRS satellites have a design life of at least 15 years. "The Boeing TDRS series ... is notable for the large, 15-foot single access antennas, which lock on and track (satellites) in low-Earth orbit," said Andrew Kopito, director of civil space programs for Boeing Space and Intelligence Systems. "Remember that TDRS satellites (are) orbiting Earth over 22,000 miles above the equator. The platforms they communicate with are in orbits typically 300 to 600 miles above the Earth. This means the TDRS satellite must track an object over 22,000 miles away that is moving across the face of the Earth roughly every 45 minutes." The ability of TDRS satellites to lock onto and track low-altitude satellites like Hubble "is analogous to standing at the top of the Empire State Building and tracking an ant as it marches its way down the sidewalk," Kopito told reporters earlier this week. "A truly remarkable capability." After three to four months of tests and checkout, TDRS-L will either be pressed into service or go into orbital storage, on standby to replace any older spacecraft that may be sidelined down the road by age-related malfunctions. Badri Younes, deputy associate administrator of Space Communications and Navigation at NASA Headquarters in Washington, said the agency plans to upgrade its space based communications systems in the years ahead, increasing data transmission speeds and testing even faster laser communications links. Depending on the health of the current constellation, the next satellite in the series, TDRS-M, should be ready for launch later this decade or in the early 2020s. "This will give us enough capability on orbit to meet NASA's need as well as those of our partners," Younes said. "We will also, keeping my fingers crossed, introduce optical communications in deep space, potentially providing streaming video from the surface of Mars. I know everyone is looking forward to that!" By the middle of the next decade, Younes said, technology should be in place "to allow us to have robust space (communications) throughout the entire solar system. We'll have made the complete conversion from the analogue domain to the digital domain." "What's in it for the taxpayers? Definitely better science data," he said. "But also, all of the technology we evolve at NASA gets transferred to the commercial sector. So commercial users (can) look forward to all these advances in technology."